RRResearch: How do point mutations in murE cause hypercompetence? How do point mutations in murE cause hypercompetence? I'm about to analyze the competence phenotypes of a series of double mutants, to try to find out how our point mutations in the murE gene cause overinduction of the competence regulon. 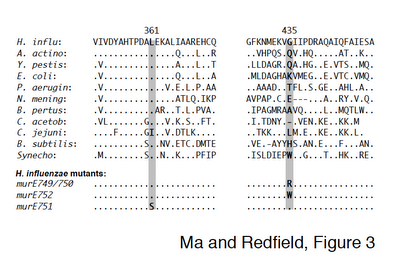 I thought I would have posted about these murE mutations before, but I can't find anything. Well, I found a previous post where I wrote "(I would have thought I'd posted previously about this set of mutants, but I can't find anything by searching for 'peptidoglycan' or 'murE' or 'cell wall', so maybe I haven't. I'd better do a separate post about them.)" Apparently I still haven't gotten around to doing that separate post, so here's a brief explanation. About 20 years ago I used chemical mutagenesis and screening to identify Haemophilus influenzae mutants with point mutations that caused them to become competent when normal cells did not. Some of these mutations turned out to be in the competence-specific regulatory gene we named sxy, and others were unexpectedly in the murE gene. Both types of mutations caused the genes in the competence regulon to be transcribed under conditions when they would normally not be, with the murE mutations having a stronger effect than the sxy mutations. This was unexpected because the MurE protein has a well-understood biochemical (catalytic) function - it's the enzyme that adds DAP (meso-diaminopimelic acid, an amino acid) into the short chains that are crosslinked into the bacterial cell wall. It's never been suggested to have any regulatory function at all. We have four mutants, all with single amino acid substitutions in murE. As shown in the alignment above (Fig. 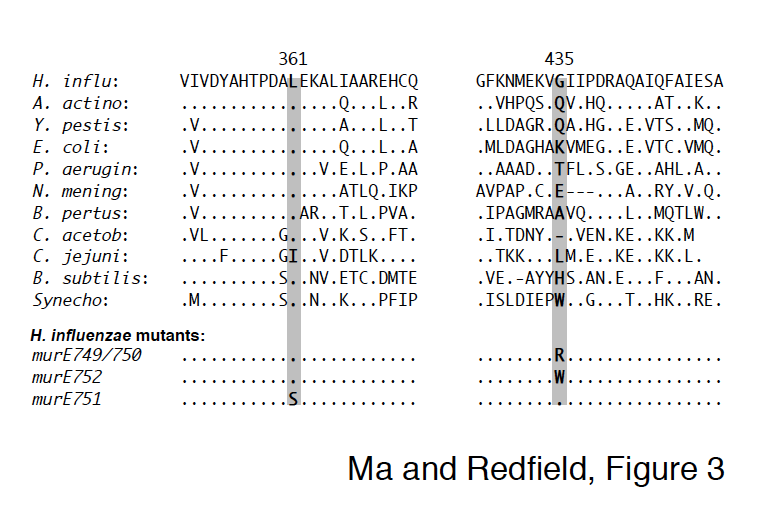 3 of Ma and Redfield, available here), two have identical G->R substitutions at position 435 (these are independent mutations), and one has a G->W substitution at this position. However this position is not well conserved even within the Pasteurellaceae, and these substitutions might not be expected to change MurE function. The fourth mutant has a L->S substitution at position 361, in a very strongly conserved segment. This change to a polar amino acid might be expected to interfere with function, since most of the >600 MurE sequences in protein cluster PRK00139 have a leucine at this position, with the only variants being some isoleucines and valines and a few methionines. However our simple tests did not find any evidence of changes to the cell envelope in any of these mutants. The mutants all grow normally and are not unusually sensitive to antibiotics that interfere with cell wall assembly or function. We also confirmed that the murE gene is essential for viability, so we know that the mutations must not act by knocking out its function. One hypothesis we tested was that the mutations acted indirectly, by changing the concentrations of cell-wall metabolites and thus altering the regulatory factors associated with recycling of cell wall components during cell growth. (There's an excellent recent review of this recycling here.) So we knocked out each of the genes for the recycling steps (ampG, ampD and mpl) and one thought to be involved in regulation (gcvA), hoping that one or more of the mutants would show dramatic changes in their competence regulation, but none did. We also tested (some of) the mutations in combination with one of the murE mutations but again saw no dramatic effect. We understand the regulation of competence much better than we did when these experiments were done, so I'm going to go back and redo these tests more carefully, looking for modest effects of the recycling mutations that might give clues to how the murE mutations turn on the competence genes. I've just made a full set of the mutations in three different genetic backgrounds: wildtype, murE749 (the best characterized of the murE mutations, and sxy-1 (the best characterized of the sxy hypercompetent mutations). We already know that the murE mutations don't induce competence genes by bypassing the need for Sxy and CRP+cAMP, since murE749 doesn't restore competence to cells with sxy, crp and cya mutations. Since we don't know whether the recycling mutations might cause increases or decreases in competence, I'm going to examine competence (transformation frequencies) under several conditions. I need to use conditions under which competence levels are reproducible; the best such condition is 'log phase' (exponential growth, low cell density, OD ≤0.2). Luckily log phase is when the murE749 phenotype is most dramatic. I do need to be careful to have the cells growing in log phase (densities lower than OD= 0.2) for at least two hours before I do my assays, to make sure they've lost any residual effects of having been at high density. I think the first time I grow all the strains in log phase for several hours I'll freeze log-phase stocks of them for starting future cultures. So here's what I'll test: First, in wildtype background, in log-phase cells growing in medium with and without added cAMP. Without cAMP the cells are not competent at all, so I can sensitively detect increases in competence. Adding cAMP will partially induce the competence regulon, allowing me to detect both increases and decreases in competence due to the mutations. Second, in the murE749 background in log phase growth (no cAMP). These cells are normally fully competent, so I will only be able to detect decreases in competence. Third, in the sxy-1 background, again in log-phase growth, no cAMP - this gives similar competence to normal cells in log phase with cAMP. Right now I have two isolates of each of the 12 genotypes I want to test. Testing them all sounds like a lot of work. Growing them all up and freezing them in log phase is the time-consuming part, but luckily they don't need to be all done at once. Guess I'd better get started. Regulation role of MurE - it may be due to the cross-linking of DAP. As cells experience different osmolality, the cross-linking of the peptidoglycan (PG) layers changes. Some sensor must sense changes in stress in the PG layer. DAP is cross-linked in the peptidoglycan layer (PG). Does you three mutants affect incorporation of DAP into PG? --> Most likely (any evidence of a reduction in DAP incorporation in to PG?) Therefore cross-linking will be less due to less DAP in PG. Cross-linking is dependent on d,d-transpeptidases (PBPs) and the l,d-transpeptidases. What happens if any of these are deleted/mutated? Same effect? If cross-linking is the reason then you should see it here?